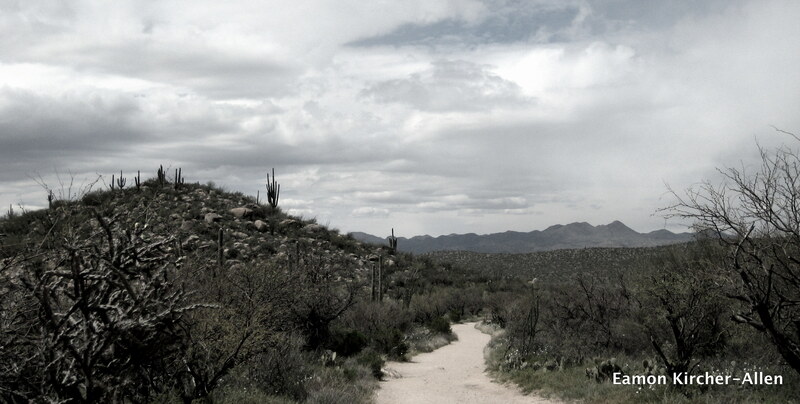 Last week, I had the privilege to spend a couple of days in Tucson, Arizona, on family business. It made me realize how much I miss the West and the great outdoors. It also gave me an excuse to use WordPress.com’s new (and a little late in the game, to be honest) slide show feature. Following are some hiking pictures from a “desert” that is in bloom after getting big winter rains. First time I ever saw miners’ lettuce outside of Northern California. I hiked to raging waterfalls, saw poppies blooming under cacti, and went from 85 degree sunshine to snow in a 25 minute drive up a sky island. And, I also spotted a troop of snookum bears! Is that it? No rants about the politics of urban development in Southern Arizona? Or a discussion of the way that Mamdani’s theories about how colonizers turned ethnicities into hardened political entities — by designating them tribes — might be relevant to the Hopi-Navajo land dispute? Not right now. This post is a little off-topic for the LGD. But life is life, and we all do as we can. * Enjoy the slide show. Whoa, Eamon. You captured some beautiful scenes – it’s always so interesting to see the desert through others’ eyes – leaving her, I forgot how beautiful it is. Now I have to go see for myself. Loved having you here. I agree! Some beautiful pics of the desert, thank you! Sounds like you’re focusing on the midwest at the moment, but wanted to share a story with you to commemorate tomorrow’s 16th anniversary of the Rwandan Genocide…not sure if it may be relevant to anything you may be working on, but wanted to share – http://bit.ly/9kviLC. Thanks, Eamon!